Color A – Begin with slip knot & ch 22. Row 1: sc in 2nd chain from hook & all the way down (21 st). ch 1 & turn. For the remaining rows, crochet through the back loop only. Row 2: sc in ea st. ch 3 & turn. Row 3: (ch 3 counts as a st), dc in first st, dc in next 3 st, dc3tog, dc in next 3 st, *3 dc in next st, dc in next 3 st, dc3tog, dc in next 3 st* 2 dc in last st. ch 3 & turn. 2nd to last row: ch 1& turn. sc in ea st.
Last row: ch 1 & turn. sc in ea st.
Sew in ends to complete your work. Pattern Notes: For a thicker scarf, adjust number of chains in multiples of 10 + 2. Crochet as many rows as needed for desired length. I made this scarf for my Nana so I went with neutral colors. However, I think the accent color would look great in a bright, bold color like red or pink! I’m not sure how happy I am with the stripes that I have chosen. 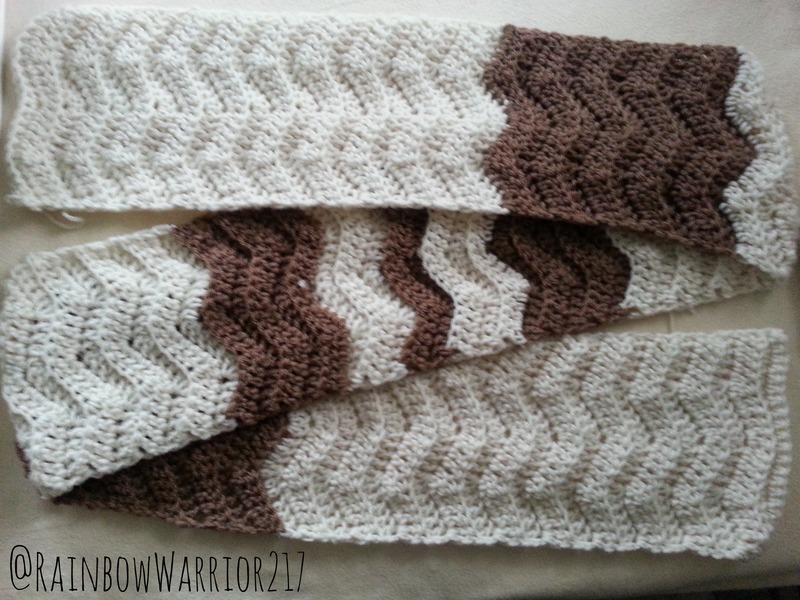 I created this so that the ends of the scarf would look cream & the section that wraps around your neck is nice & stripy. I really hope she likes it! Can’t wait to make more chevron accessories! What would you like to see me make? What a nice pattern. My sister would love to make this. Doesnt make.. sense… I get it all to row 3. Then I dont understand how I run out of the row and you still have st left in your row to do. Wtf? nevermind I see. I shouldnt crochet at 2am. I feel this would make a beautiful blanket. Any ideas on how to make it wider? I think so too! You want to work with a number of stitches with a multiple of 10 + 2 and when you work the pattern row repeat between each ‘*’ until you reach the last stitch. I love this pattern! I made a tri-colored Seahawks scarf using it. I did 15 blue, 10 lime green, 5 white, 10 lime green, 15 blue, 10 lime green, 5 white, 10 lime green and 15 blue. It turned out beautifully! The Seahawks colors are my favorite – That sounds absolutely gorgeous!!!! you should probably put “back loop only” in the written instructions. Also, for that last bit of row 3, im assuming i’m going to end with 3 total double crochets in the last stitch. your instructions read as though there should be 1 additional stitch that you put those last 2 doubles in before chaining and turning. i redid the row 5 times before i just continued and realized what it meant……assuming thats what it meant. ok, watching the video it looks like i started at the right place on row 3 but was left with 0 stitches so my last stitch has 3 double crochets in it total. i dont know whats going on, i’ve been redoing this row for the last 3 hours. I’m right here with you… ugh. *sigh* nvm, i looked over the instructions and the math is checking out, and i see the back loop only part too. i dunno how i managed to make the same 2 mistakes over and over for the last 4 hours but i did. its 2AM, im starting from scratch tomorrow. Today wins. 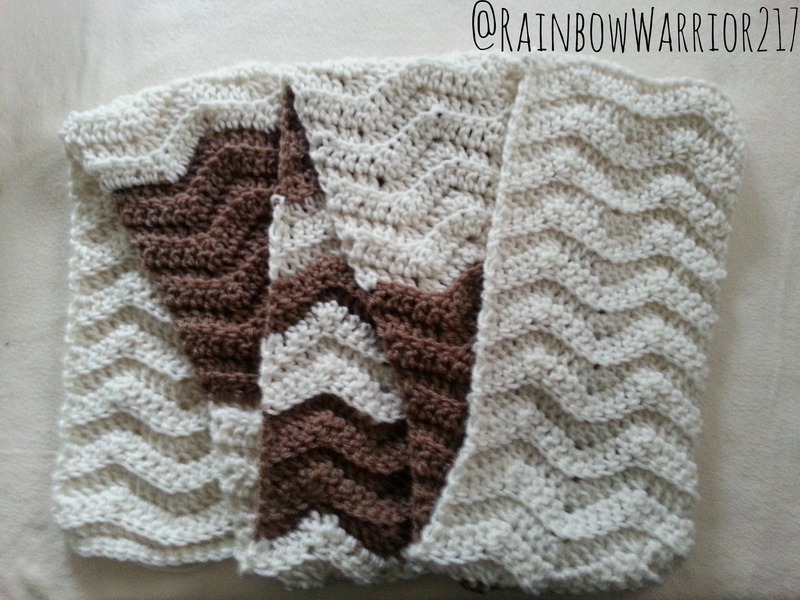 I would love to see a coordinating chevron hat to go with this scarf! 🙂 Maybe a pair of those fingerless mittens with the flap that can button up (to leave fingertips bare) or be put over the fingers (to cover fingers) for warmth. Anyhow, I have been trying to do this pattern for a while (my first pattern I’ve ever read), and I am having trouble knowing where to start crocheting after I turn and have to double crochet… I think that is once I turn into my third row… I would love any pointers. So, after my 2nd row, I chain 3 and turn; and then, what does it mean that chain 3 counts as a st? Where does the dc begin in teh 1st st? Thank you in advance for any help you can offer. I watched the video over and over. I’m feeling determined… would love to know what I’m doing wrong and how to fix it! Right below your chain 3, you will see the two loops which consist of your first stitch. The chain 3 is representing a double crochet stitch here and then you are placing two double crochet stitches in that first stitch. This makes a cluster of 3 double crochet stitches and then you continue the pattern crocheting into the second stitch. It is really important that you don’t skip over that first stitch and it can be hard to figure out. Here is a link, scroll down and there is a great picture of the first and second stitches in a double crochet row. http://www.crochetguru.com/double-crochet-stitch.html much more helpful to see it & I feel like I did not not explain as well as I would have liked. How many rows in all did u do? I’ve been attempting this for the last 3 hours following the video but it’s just all wrong. It’s not going up and down, just into a kind of upside down rainbow shape. 😫 What am I doing wrong?! I love this scarf! Do you have any tips on crocheting a v scarf like not the chevron but only one set that makes a v? My daughter really really wants me to make her one but im lost….. Im making this scarf for myself! Thank you! Hello – I love this scarf and love your instructions, thank you so much! I have a question – when I am doing the last 2 DC in the last stitch – are those still in the back loop only? Or are they in the entire last stitch – which is actually a chain 3 from the row below, right? Thank you!